This weekend I cooked a paleo style three course meal for two of my friends. As we are big fans of Mexican food (isn’t everyone? ), I thought I would do a grain free, gluten free and carbohydrate free (which my type 1 diabetic Editor loved) version of soft tacos. The tacos are pretty much just made from cauliflower and eggs and taste delicious. I got the inspiration for these from an awesome website called Empowered Sustenance and just added some extra herbs and spices to the recipe. 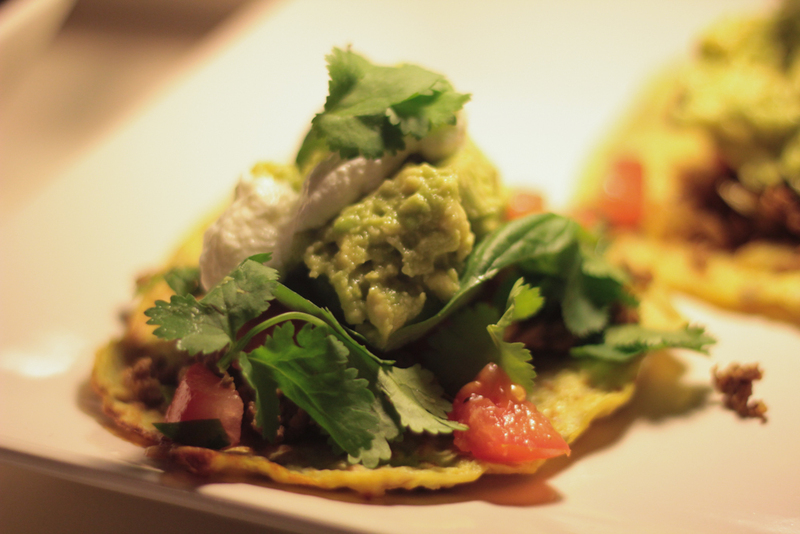 I have also included the recipes for the guacamole, mince and salsa in this post. I will post what I made for the entrée and dessert later on in the week. Also a big thank you to Julien for taking all these beautiful photos. In a food processor pulse the cauliflower until it forms tiny crumbs. Place the crumbs in some boiling water with the lid on for about 8 minutes, then pour the cauliflower into a sieve and drain, making sure there is no excess water left. In a bowl stir the cauliflower with the rest of the ingredients until well combined. Line three baking trays with baking paper and form three thin circles on the sheets. With a spatula, press down the mixture so it forms a thin layer, making sure there is no paper showing through the mixture in any area of the wrap. Place in the oven for about 15 minutes until they are firm and dry. Then immediately move the wraps to a wire rack to cool. I used beef mince for this but you could use any good quality meat mince. If you would prefer this meal to be vegetarian, beans or lentils would also be a great alternative. In a large frying pan heat the oil, then add in the garlic and onion until brown. Add in the rest of the ingredients and using a fork break up the mince. Stir until it is all browned. Serve with the tacos. Remove the avocados from their shells and place in a large bowl. Roughly mash them up. Mix in all the other ingredients until well combined. If you would prefer a smoother consistency you can mix all the ingredients in a food processor but I personally prefer it a little chunkier. Serve alongside the tacos. Mix all ingredients together and serve alongside tacos. Serve with natural Greek yoghurt and fresh basil and coriander. I am loving your take on Mexican! As I have a corn sensitivity, I struggle with normal corn tortillas and nachos; I just feel ick after eating them. These look lovely and I am sure will be making an appearance at our dinner table soon 🙂 Keep up the great work Mia! Thank you Erica! 🙂 Another great thing to use as an alternative to corn chips is Poppadoms made with either chickpeas or lentils.